The Bodum double wall glasses are the ideal year-round glasses - keeping cool drinks chill and hot drinks toasty warm. Crafted of a strong but lightweight borosilicate glass, these glasses are both dishwasher and microwave safe, and can be placed on any surface without a coaster. With a light hand feel and slight heft, the double-wall insulated glass is simply the best possible vessel for any coffee or tea drink. Burn Free - With the double wall feature you won't need to worry about your fingers burning. 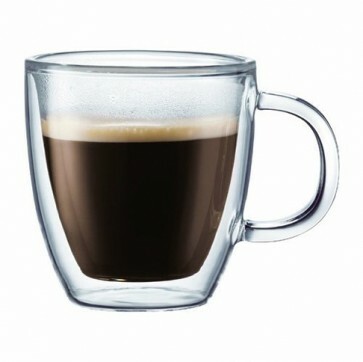 Lightweight - This glass boasts a tall cup o' joe but when you pick it up the lightweight glass isn't a burden to carry. A Little Fragile - Even borosilicate resiliency doesn't save these glasses from occasional mishaps. One of our test glasses sprung a leak between the inner and outer wall. Gentle care is recommended. Compared to your usual coffee mug, this glass is lightweight and protects your fingers from burns with it's double walls. For detailed care instructions, please refer to the user manual. We recommend that you also incorporate the following into your cleaning routine: Clean the glasses after each use. Dishwasher safe.